The surge of U.S. troops in Baghdad is succeeding but deeper structural problems continue to plague the American presence in Iraq. The country's largest dam, 40 kilometers northwest of Mosul, near the Turkish border, spectacularly symbolizes this predicament. Just after occupying Iraq in April 2003, a report found that Mosul Dam's foundation was "leaking like a sieve and ready to collapse." A more recent, still-classified report from the U.S. Army Corps of Engineers concludes that "The dam is judged to have an unacceptable annual failure probability." More explicitly, the corps finds the current probability of failure to be "exceptionally high." A senior aid worker calls the dam "a time bomb waiting to go off." Mosul Dam, formerly known as Saddam Dam (Arabic: "Sadd Saddam") is in danger of collapse. 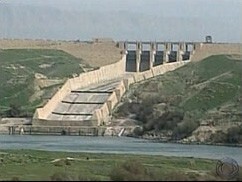 Mosul Dam, formerly known as Saddam Dam (Arabic: Sadd Saddam) is in danger of collapse. That's because the dam was built on unstable bedrock of gypsum that requires a constant infusion of grout to prevent the foundation from eroding and the giant earthen wall from collapsing. Over the years, engineers have pumped into the foundation more than 50,000 tons of a bentonite, cement, water, and air mixture. As the Washington Post explains, "Twenty-four clanging machines churn 24 hours a day to pump grout deep into the dam's base. And sinkholes form periodically as the gypsum dissolves beneath the structure." Despite these efforts, the dam's condition continues to deteriorate, raising the prospect of its complete collapse. 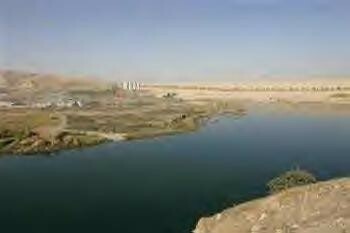 Were this to happen with a reservoir full of water, predicts Engineering News-Record, "as much as 12.5 billion cubic meters of water pooled behind the 3.2-km-long earth-filled impoundment [would go] thundering down the Tigris River Valley toward Mosul, the second largest city in Iraq. The wave behind the 110-meter-high crest would take about two hours to reach the city of 1.7 million." In addition, parts of Baghdad (population 7 million) would come under 5 meters of water. Many Iraqi officials, unfortunately, exhibit a cavalier attitude toward these dangers, further exacerbating the problem. They reject as unnecessary, for example, the Army Corps recommendation to build a second dam downstream as a back-up. Yet, were a catastrophic failure to take place, who would be blamed for the unprecedented loss of life? Americans, of course. And understandably so, for the Bush administration took upon itself the overhauling of Iraqi life, including the Mosul Dam. Specifically, the U.S. taxpayer funded attempts to shore it up by with improved grouting, at a cost of US$27 million. The Special Inspector General for Iraq Reconstruction has, however, judged these efforts mismanaged and ineffective. Mosul Dam from the distance. Massive Iraqi deaths would surely spawn conspiracy theories about American malevolence, inspiring epic rage against the U.S. government and creating a deep sense of guilt among Americans themselves. Yet, this blame and remorse would be entirely misplaced. Saudi and other Arab aid – not U.S. monies – funded the Saddam Dam. A German-Italian consortium headed by Hochtief Aktiengesellschaft built the US$1.5 billion structure in 1981-84. It had a primarily political goal, to bolster Saddam Hussein's regime during the Iran-Iraq war. The dam, in other words, had nothing to do with the United States – not in funding, construction, or purpose. Nonetheless, misbegotten American policy has made it an American headache. Mosul's dam replicates a myriad of lesser problems in Iraqi life that have landed in the lap of Americans (and, to a much lesser extent, their coalition partners), such as provisioning fuel and electricity, working schools and hospitals, a fair political and legal system, and an environment secure from terrorism. Since April 2003, I have argued that this shouldering of responsibility for Iraq's domestic life has harmed both Americans and Iraqis. It yokes Americans with unwanted and unnecessary loss of life, financial obligations, and political burdens. For Iraqis, as the dam example suggests, it encourages an irresponsibility with potentially ruinous consequences. A change of course is needed, and quickly. The Bush administration needs to hand back responsibility for Iraq's ills, including and especially the Mosul Dam. More broadly, it should abandon the deeply flawed and upside-down approach of "war as social work," whereby U.S. military efforts are judged primarily by the benefits they bring to the defeated enemy, rather than to Americans. Nov. 7, 2007 update: A new weblog, "The Latest about Mosul Dam," pursues the Mosul Dam saga, starting with a dam breach in Gaza and its effect.